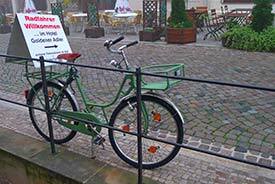 ABOVE: A sign on a parked bicycle advertises a bike-storage room in the Hotel Goldener Adler. Lutherstadt Wittenberg has a dozen or so hotels, plus a reasonable selection of guesthouses, holiday apartments, private rooms, and other accommodation. I can personally recommend the four-star Luther-Hotel Wittenberg. The modern hotel is located in the town center, about two minutes on foot from the Rathaus and the Stadtkirche. Its 165 rooms are furnished in German contemporary style (lots of blond wood, with duvets on the comfortably firm beds), and the moderate rates include a generous buffet breakfast. It has its own parking garage. The Brauhaus-Hotel Wittenberg is an affordable choice for beer aficionados. The building, which dates back to 1512, has been a microbrewery, restaurant, and hotel since 1999. For more hotel listings, visit the Wittenberg tourist office's Web site (see link at bottom of page). Two hostels are in the city center: the Hostel Wittenberg at Schlossstrasse 14/15, and the YMCA Recreation Center Glöcknerstift at Fleischer Strasse 17. Camping is available at the Marina Camp Elbe, which has caravan spaces and "Radler huts" for bicyclists, and a marina for boaters on the Elbe. The restaurant at the Luther-Hotel Wittenberg is on a level with many big-city peers. The hotel's talented chef, Christian Hirsch, makes good use of fresh fish, vegetables, cheeses and other regional ingredients when preparing his international and Mediterranean menus. Vegetarian and vegan meals are available on request. For more rustic fare, the Brauhaus-Hotel Wittenberg is worth trying. Prices are reasonable for ribsticking specialties like beer and onion soup, Schnitzel with mushrooms and potatoes, and grilled pork hocks with sauerkraut. Wittenberg's tourist-information site describes many other restaurants and cafés in its "Gastronomy" section. If you're on a tight budget, check the list of Döner Kebab shops in Wittenberg at Doenerfreund.de.